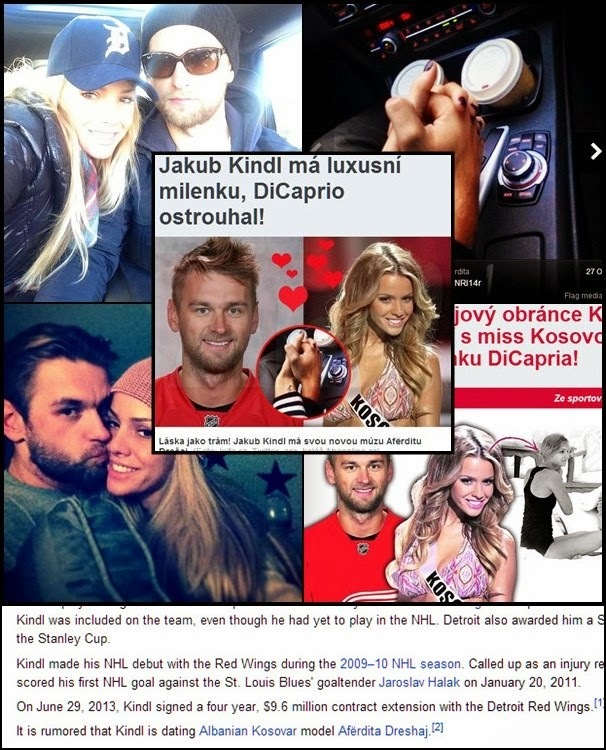 It is now official, the beautiful albanian model, Aferdita Dreshaj is in love affair with Czech hockey player, Jakub Kindl. The media report that the relationship began several months ago and first clues began after they often communicated with each other through Twitter network, while Aferdita also posted pictures that hinted a connection between them. Latest photos coming from her social network, remove any doubt, as she appears in public to embrace the hockey player. Czech media are already writing a lot about this affair, where they refer to Aferdita as the former girlfriend of Leonardo Di Caprio, while we were surprised when we saw that the biography of this hockey player in Wikipedia, also referred to this affair between him and the Albanian model. p.s. Ju themi te verteten, jemi pak ne dyshim, pasi mashkulli ne foton poshte majtas, duket zeshkan ndersa hokeisti pak a shume biond. A behet fjale per dy meshkuj te ndryshem? Ne fakt, sa meshkuj ka Aferdita sot?